Have you ever tried Pici pasta? If you never visited the Siena area in Tuscany, Italy I bet the answer is No. Pici are a traditional pasta cut from Siena which is relatively hard to find outside Tuscany although, in my onion, are super delicious. They are really thick spaghetti, very similar to the Asiatic Udon noodles but they have the same bite than regular al dente pasta (contrarily to Udon noodles). 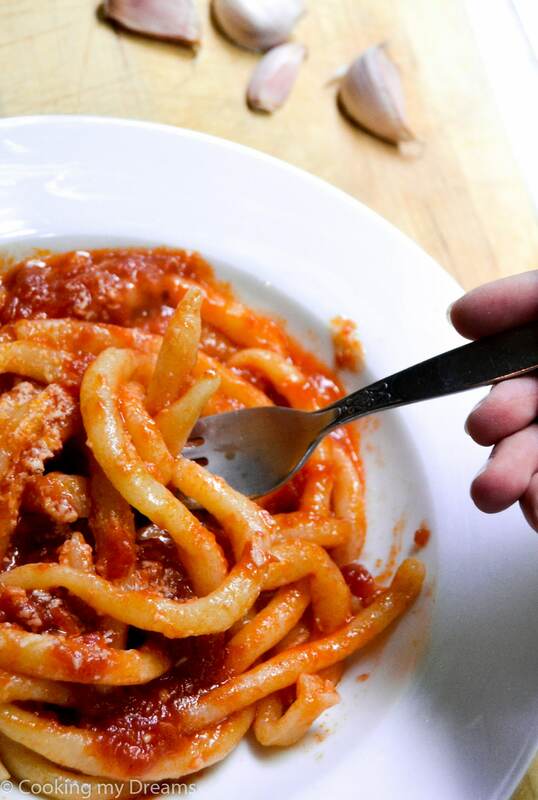 Their typical thickness makes every Pici dish a real indulgent dish to devour with gusto, every bite is a mouthful of pasta and sauce which probably will splatter all around you. Not really classy, no. But rustic dishes are my favorites. Pici pasta is usually served with creamy sauces – like the one in this recipe – or Ragù (my favorite is Pici with wild boar ragù). Unlike other types of long pasta – such as Tagliatelle, Tagliolini, etc – Pici are usually made with only semolina flour and water, with sometimes the addition of an egg or an egg white, depending on the recipes of family traditions. The sauce “all’aglione” literally means “big garlic”; now, big garlic doesn’t really make sense but it gets the idea across perfectly because garlic is the main star of this sauce. Aglione, by the way, is a rare kind of garlic that can be found in Tuscany. It is slightly bigger than the normal garlic – hence the name – and with an intense and slightly sweeter taste. But I tried this recipe with standard garlic (the only I can find in the Netherlands) and it turned out great, so go for it! This sauce can be loved or it can be hated. For you garlic haters: just avoid the garlic and make the spicy tomato sauce adding a little bit more chili pepper flakes. It will become “Pici all’Arrabbiata”! Anyway, feel free to add more garlic cloves or remove some, according to your taste. Also, instead of mashing the garlic you can thinly slice it; this way you can easily remove it from your plate if your don’t like it but it will still infuse the sauce with flavor. Start making the pasta dough. Pour the semolina flour in a bowl and add a little bit of water at a time while mixing with your hands; when it starts to come together, add the olive oil and salt. Knead the dough for 8-10 minutes adding more water if it crumbles or more flour if it's sticky until it becomes a smooth elastic ball. Cover the pasta dough in plastic wrap and set aside to rest. Start making the sauce. In a medium pan or pot, drizzle some olive oil and add the mashed garlic cloves. Turn on the heat to low and when the garlic starts to sizzle, add the canned tomatoes. Mix with a wooden spoon and turn the heat to medium. Add a teaspoon of sugar to break the acidity of the tomatoes (add more if needed), then add the chili pepper flakes and salt to taste. Bring to simmer than turn the heat again to low and let it simmer for about 15-20 minutes. While the sauce simmers you can roll out the pici. Dust a cutting board (better wood or marble) with semolina flour and knead the pasta until it doesn't stick anymore to the cutting boeard, then roll it with a rollin pin until it's about 1/2 cm (1/4 inch) thick then cut it into stripes of the same thickness. Roll the stripes of dough between your palms or on the cutting board as you prefer until you have Pici (you may cut the stripes in half if they are too long, Pici should be more or less as long as Spaghetti). Boil the pici in salted water for about 10 minutes or until al dente. Drain the pasta and toss is the sauce; remove from heat and serve with grated Pecorino or Parmesan cheese on top. I’m wondering whether it is common to brown the garlic before adding in the tomatoes when making this specific sauce. Does the garlic have to retain its natural sharp flavor for the sauce to be authentic aglione, or is it OK to make it sort of fragrant and crispy? Also, do people practice adding a little wine or wine vinegar? Wine or wine vinegar are never used in this sauce because it would be too acidic. Thanks a lot for your reply, Jessica! It gave me a better idea on what to shoot for. Have a nice day and please keep publishing recipes of Tuscan dishes! Buondì Jessica…bello il tuo piatto di pici! Mio marito ci aggiunge anche un sacco di spezie al sugo. Interessante la ricetta dei pici stessi….non li ho mai fatti ma ci proverò senz’altro. Ciao Katia, grazie mille per il tuo commento! 🙂 Che spezie aggiunge tuo marito? Sono interessata a provare variazioni! I was wondering how the tomatoes make a sauce. Are you suppose to break the down with the spoon?